» A FESTIVAL OF CHARLEY CHASE SHORTS, by Walter Albert. A FESTIVAL OF CHARLEY CHASE SHORTS, by Walter Albert. Just about everyone is familiar with the iconic greats of silent film comedy, but Charley Chase, a multi-talented comedian, a director, writer and actor, also an accomplished musician, who appeared in some of the best silent film two-reelers, is largely forgotten today. Not however, by the programmers of film conventions, with Cinevent 40 [Columbus OH, May 2008] taking pride of place for its annual screening of selected comedies. Three of his shorts opened the Sunday evening program,with “Bromo and Juliet” (1926) one of his best, followed closely by the inspired antics of “Forgotten Sweeties” (1927) and “Movie Night” (1929). Charlie was an eternal optimist, striving to be successful in love and in business, and usually failing miserably at both. 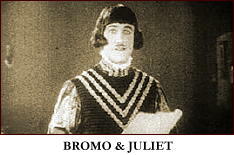 In “Bromo and Juliet,” directed by Leo McCarey, Charley is starring in an amateur production of Shakespeare (and just to see him, with his spindly legs in tights, is enough to justify the price of admission). He’s undercut by his fiance’s father, who has a weakness for the bottle, and constantly thwarted by Oliver Hardy as a taxi driver who just wants to get paid for his services. When the hapless Charley finally gets onstage, his histrionics catch the audience’s fancy, and his every misadventure feeds their delighted appreciation. “Forgotten Sweeties,” directed by James Parrott (Charley’s younger brother), deals with a classic Chase situation, the husband who’s suspected by his wife of cheating on her with an attractive neighbor. It’s all a comedy of misunderstanding, but the misunderstandings result in some perilous marital moments for Charley, before it’s all resolved happily, if messily. The final short, “Movie Night,” with a story by Leo McCarey and directed by Lewis Foster and an uncredited James Parrott, has Charley, his wife and two kids (with the older played by the inimitable Spec O’Donnell) set off for an evening at the movies, where chaos eventually ensues. This reinforced my long-time conviction that the only place to sit in a movie theater is on the aisle. Years ago, my local library used to have a Super 8mm section. One day I checked out LONG FLIV THE KING and have been a Charlie Chase fan every since. Walter first brought Charley Chase to my attention years ago, prompted perhaps by their strong resemblance, and I’m grateful for it. There is a whole lot of Charley Chase on youtube. So, before you get the DVDs, you can have a look and see whether you like it. To think that there is some resemblance between me and the sublime Charley Chase buoys me up no end, even though I suspect Dan of seeing the resemblance in our mutual tendency to get involved in misadventures. Or maybe it’s the mustache. As long as it isn’t the legs, Walter…. That first comment reminds me of how I first saw Charley in one of his silent classics. As a Laurel and Hardy buff, I had always heard from other L&H buffs about how Mr. Chase was a great comedian. I had only seen him in his brief appearance in the 1933 L&H feature, “Sons of the Desert”, and didn’t quite see the genius that they said that he had as a comedian. Then one day, at the age of 19, I checked out an 8mm silent print of “Crazy Like a Fox” from the local library (back when they still had such things), and found myself completely delighted with Charley, and found that he was every bit as funny as I had heard. Years later, when I started buying copies of “The Lost Films of Laurel and Hardy” DVDs, I found myself completely enjoying Mr. Chase’s comedies, like “Fluttering Hearts”. It is wonderful that after so many decades of being dead and mostly forgotten, the delightful films of Mr. Chase are available on DVDs, and even being shown in some theatres. 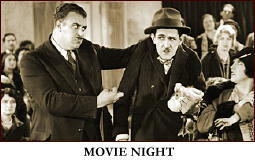 I saw his “Movie Night” at the Portage Theatre in Chicago about 4 years ago, and everyone was laughing with the wonderful performances of Mr. Charley Chase. The two Kino DVDs and the 4-disc set, “Becoming Charley Chase”, are wonderful additions to anyone’s collection of great comedy films.